Oihhh... I hope you like the frost. Yup - but we are much, much warmer today. I thought only in Canberra. I remember it being frosty in Melbourne, ice forming even. We will never see that again in our hot city. What a capture! I love it. Fantastic shot. 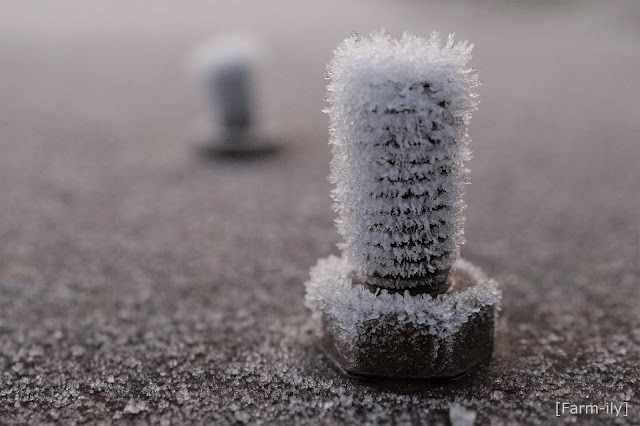 The frost turns even a bolt into a piece of artwork. Amazing macro shot! Looks like winter has arrived. Brrr! What a frosty shot! Fantastic close up! Crisp morning there it seems. Good capture.